Blankiet Estate vineyards and winery are located on the western foothills of the Mayacamas mountain range over-looking Yountville in the Napa Valley of California. Created in 1996 by Claude and Katherine Blankiet, sixteen acres have been developed by renowned viticulturist David Abreu. The vineyards, known as Paradise Hills, are stunningly beautiful with gorgeous views of the valley. Cabernet Sauvignon, Cabernet Franc and Petit Verdot are planted on volcanic soil. Merlot is planted on a deep layer of alluvial clay deposited by streams draining the mountain range. Organic farming is practiced and the human hand is the connection between vines and wines. Our artisanal production amounts to less than a few hundred cases each of three flagship Red Wines: The “Estate Paradise Hills Proprietary Red” a predominantly Cabernet Sauvignon with various percentages of Merlot, Cabernet Franc and Petit Verdot. The “Rive Droite Paradise Hills” is a Pomerol inspired assemblage of Merlot with a touch of Cabernet Franc. The "Mythicus Paradise Hills" is a selection of 100% Cabernet Sauvignon. We also produce a small quantity of a delicious Rosé, barrel fermented and aged in new French oak. Lastly, a companion red wine is assembled from barrels that did not get selected for the flagship cuvées. Both these wines are produced under our “Prince of Hearts” label. Vinification at Blankiet Estate is done in a state of the art winery located on the property. Our wines are aged in our deep underground caves for two years in 100% new French oak barrels and bottled without fining or filtration. Vaulted ceilings made with 18th century bricks. Antique furnishing, old masters paintings European castle atmosphere. 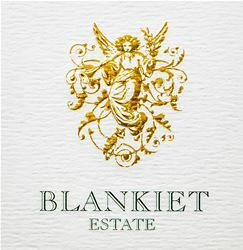 To join the wine club, visit www.blankiet.com or call 707-963-2001. Blankiet Estate is certified under the Napa Green Winery Program by the Napa County Department of Environmental Management (DEM) and the Association of Bay Area Government’s (ABAG) Green Business Program and completed all the regulatory components needed for environmental sustainability. These components included developing water and energy conservation methods, preventing pollution, and reducing solid waste. In addition to developing sustainable winery practices, this program is set to become the standard for the state of California. Blankiet Estate is certified under the Napa Green Certified Land Program. Blankiet Estate has created and implemented a customized farm plan with measured results that addressed all aspects of its property, vineyard land as well as non-farmed land, including practicing soil conservation, water conservation, stable drainage, riparian corridor enhancement, fisheries and wildlife habitat enhancement and long-term improvement and sustainability.